Layout and exploded drawings for most years & engines with 5 to 275 hp. 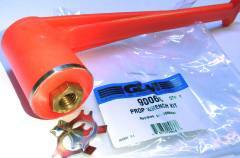 12050 water pump kit 9.9 -15 hp. U-joint, exhaust bellow and shift cable bellows. 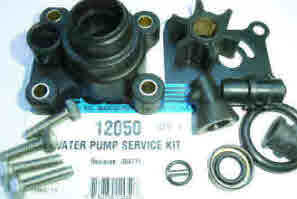 Lower unit seal kit and water pump kits with impeller. 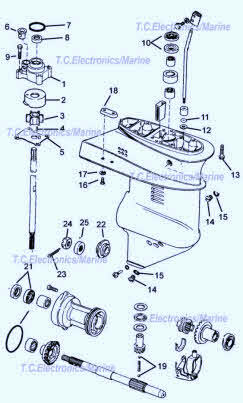 Power head carburetor kit, in-line fuel filter and fuel pumps. Propellers, prop shaft with prop nut and thrust washer hardware. Piston and piston rings and power head gaskets. Lower unit gear sets, clutch dog with pinion and forward gears. Drive shaft both long and short with main bearings. Bearing carrier complete with o-ring-seals, bearing and anode. 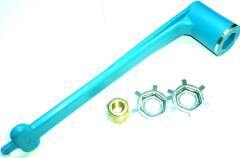 GLM boat propeller wrench, Johnson/Evinrude parts and many types of OMC tools.